Hello everyone, Sue here, happy August. If you'd like to get started on your Christmas card making, we have a great little offer for you on some of our designer 6x6 cardstock and mini stencils at the very affordable price of only £10, instead of the usual price of £24 - a saving of MORE THAN 58%!! This offer would be a great present for a crafting friend, or you could buy two and take them to your craft club for a great mini make class. This is an ‘only while stocks last’ offer, so don’t miss out. As you know, we don't do special offers often and they always sell out very quickly. The cardstock has a laminate core which makes it a fantastic background for stencilling with Sparkle Medium. You can stamp on the card too, as long as you heat emboss the image. You can see some of the sample cards in the picture on our Facebook page and on the web site. Our Lisa has a great technique where she stamps and embosses on the card, then brayers a little Diamond Sparkle Medium over the image to give it a bit of sparkle! calico drawstring bags, as seen in our recent One Day Special on Hochanda. Lisa and I are looking forward to being back on Hochanda on Tuesday, August 16 for three one hour shows. We've got some brand new products, including the amazing new Patina Paste, beautiful new Art Stamps and some great MDF ideas. We hope you can join us. Until next time, thanks for your support, have a lovely weekend. Hello everyone, greetings from all of us at Imagination HQ, we hope you're enjoying the summer. 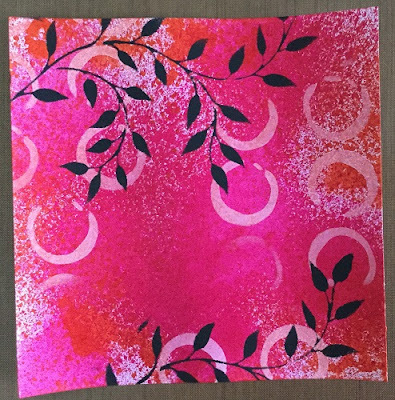 A while ago, I made lots of samples using a number of our new stencils, Mixed Media Ink Sprays & Starlights, but I never got a chance to blog them. I'm going to try to remedy that for August, interspersed with posts about our upcoming shows on Hochanda. 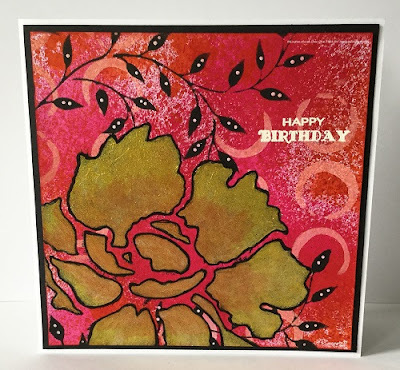 The background for this card was Mixed Media Ink Sprays - Fuchsia, Light Fuchsia & Orange - white gesso through the Broken Circle stencil & black gesso through the Leaf Swirl stencil. I applied two of the new Starlights - Chartreuse & Pink Sunset - through the Peony Large Flower stencil, building up layers of colour & when the paint was dry, I outlined all the sections with a permanent black pen. 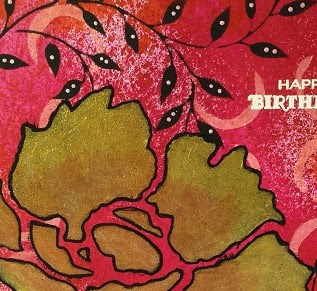 I added dots to the leaves with a white pen & a sentiment from my stash with embossing ink & white embossing powder. I used black card as a matting layer & a 7x7 white card blank as the base. Thank you for visiting the blog today. I'll be back with another project later in the week.